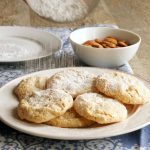 Amaretti cookies are deliciously sweet and crunchy Italian almond cookies. This recipe is from the Emily Richards' cookbook Per La Famiglia. Preheat your oven to 350 degrees Fahrenheit (180 Celsius). Line 2 baking sheets with parchment paper and set them aside. The author warns against using dark metal baking sheets for these cookies to prevent over browning and I have to agree. Add the almonds to your food processor and blend until they're in small pieces with some powdery granules. Set the almonds aside. Beat the egg whites to soft peaks in a large bowl. Gradually beat in the sugar until ribbons fall from the beaters when you lift them out of the mixture. Stir the almonds into the egg white mixture, along with the flour, almond extract and baking powder. Drop level tablespoons of the batter onto the prepared baking sheets about 2 inches (5 cm) apart. If you need to, shape each mound of batter into a neat circle. Bake them in the centre of the oven for about 10-12 minutes or until the cookies are a light brown colour and crisp on top. The author suggests 12 minutes as a baking time, but mine were always done after 10 minutes. Let the cookies cool on the baking tray for a few minutes before transferring them to a cooling rack to cool completely. Sprinkle some icing sugar on top, if you wish, and enjoy!